ALLEGATIONS THAT Justin Trudeau, Canada’s prime minister, put pressure last year on Jody Wilson-Raybould, then justice minister and attorney-general, to drop a criminal case against a large construction company have dominated the news for almost a month. Ms Wilson-Raybould says that the Liberal prime minister and his officials pushed her to suspend the prosecution of SNC-Lavalin for bribing Libyan officials prior to 2011, and fine the company instead. Mr Trudeau admits that he raised the matter with Ms Wilson-Raybould because he wanted to protect 9,000 jobs, but denies that he and his officials did anything inappropriate. He did not override Ms Wilson-Raybould’s decision to proceed with a trial. And she has not accused him or his aides of criminal behaviour. So why is Mr Trudeau in trouble? When Mr Trudeau led the Liberals to victory in the election in October 2015, he called himself a feminist, promised to improve Canada’s troubled relations with indigenous peoples and pledged to conduct an open and transparent government. These promises look empty after Ms Wilson-Raybould, an indigenous politician, told the parliamentary justice committee investigating the affair on February 27th that the prime minister and his officials had tried to strong-arm her. The most senior bureaucrat in Ottawa issued “veiled threats” of what would happen if she did not change her mind, she testified. (That bureaucrat, who has testified previously, is due to appear before the committee again on March 6th.) She believes that she was demoted in January to the more junior post of minister of veterans’ affairs as punishment for resisting. She resigned from cabinet last month but still sits as a Liberal MP. Opposition parties have piled in, hoping to do as much damage as possible to the Liberal brand during this last session of parliament before Canadians vote in the next parliamentary election, due in October. Andrew Scheer, the Conservative leader, says Mr Trudeau should resign. The prime minister’s damage-control efforts received a blow on March 4th when Jane Philpott, one of his most competent and respected ministers, quit as president of the treasury board, the government’s main administrative department. Ms Philpott said the pressure on Ms Wilson-Raybould raised serious concerns about the independence of Canada’s justice system. “Sadly, I have lost confidence in how the government has dealt with this matter and how it has responded to the issues raised,” she wrote. China has seized on the controversy to argue that Canada’s judiciary did not behave independently of government when it ordered the arrest in December of Meng Wanzhou, the CFO of Huawei, a big Chinese telecoms company, at the request of American prosecutors. The dispute has poisoned relations between Canada and China. Mr Trudeau faces more pitfalls. Gerald Butts, his former principal secretary, is to testify before the justice committee on March 6th. Ms Wilson-Raybould says he exerted some of the pressure. The parliamentary ethics commissioner and justice committee will issue separate reports. Mr Trudeau must still decide whether he wants Ms Wilson-Raybould and Ms Philpott to remain members of the Liberal caucus now that they have lost confidence in his government. Expelling them could be explosive. Even before the Globe and Mail, a national newspaper, first published the allegations of backroom pressure on Ms Wilson-Raybould, the Liberals were dropping in the polls. Some indicate that the Conservatives would win if an election were called today. Most Canadians say the economy, rather than issues like SNC-Lavalin, will determine their vote in October. Unfortunately for Mr Trudeau, the latest statistics show that the economy has stopped growing. 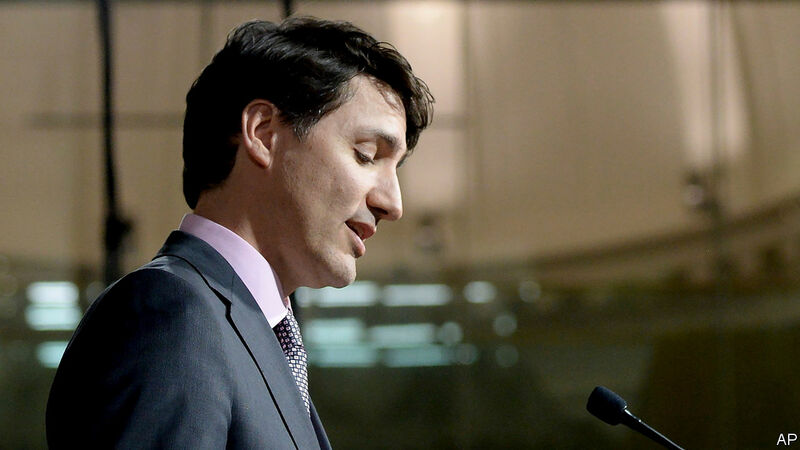 If Mr Trudeau weathers the SNC-Lavalin scandal, a weaker economy could jeopardise his re-election.